In case you are not aware, Gmail has this option under the Settings Tab which is labeled themes. This option gives you several cool themes that you can use for your Gmail account. 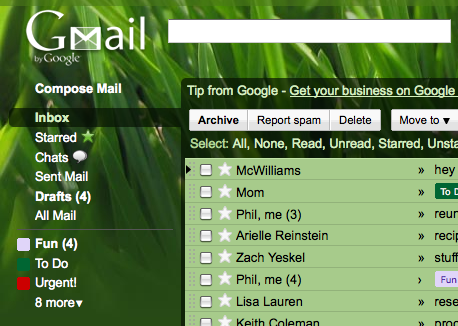 And Gmail has just added not just one but four uber cool themes to its selection. These themes are named Turf, Orcas Islands and High Score plus another theme option labeled – Random.Turf and Orcas Islands are geared for nature loving Gmail users who likes reading their mails with nature and landscape-inspired backgrounds. Turf is great looking and its predominantly green motiff is very pleasing to the eyes and will entice you to continue reading your emails. Orcas Islands on the other hand will give you the feeling of actually being on the Bing search portal since the background is a landscape photo stretched out to fill your browser screen. High Score on the other hand will remind you of the Super Mario world. 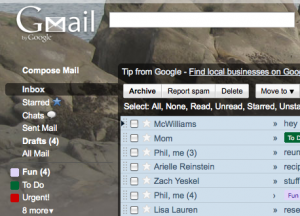 In case you can’t decide which of these three new themes you would like to use, you can select the Random theme and let Gmail randomly assign themes to your Gmail Inbox. 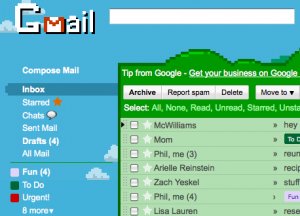 Incidentally, the announcement of these new themes was done via a blog post at the Official Gmail Blog. The post was written as if two Google engineers are chatting with each other. Does it cost to use one of the theme s from your selection?